If you're obsessed with relaxed dressing when it comes to fashion, you'll love this totaly chic pairing of a grey boucle open cardigan and a Cartier panthre de small 22mm 18 karat gold watch. Black leather high top sneakers complement this look very well. If you're all about feeling relaxed when it comes to putting together an outfit, this combination of a tan leather biker jacket and a Cartier panthre de small 22mm 18 karat gold watch is just for you. Kick up the cool of your ensemble by finishing off with black leather heeled sandals. If you're all about being comfortable when it comes to fashion, this combination of a pink blazer and a Cartier panthre de small 22mm 18 karat gold watch from NET-A-PORTER.COM is right what you need. To bring out a sassier side of you, complete your look with black athletic shoes. If you're obsessed with comfort dressing when it comes to your personal style, you'll love this incredibly chic combination of a white long sleeve blouse and a Cartier panthre de small 22mm 18 karat gold watch. Up the cool of your look by completing it with white leather pumps. If you're all about feeling relaxed when it comes to dressing up, this combination of a white bodycon dress and a Cartier panthre de small 22mm 18 karat gold watch is just for you. And if you want to instantly up the style ante of your look with one piece, add black suede heeled sandals to the equation. 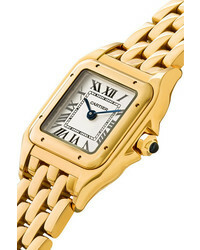 Rock a black double breasted blazer with a Cartier panthre de small 22mm 18 karat gold watch for comfort dressing from head to toe. When it comes to footwear, this getup is complemented really well with black and white low top sneakers. 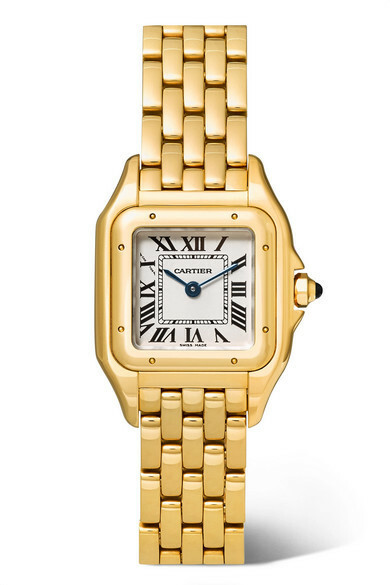 Try teaming a grey slit maxi dress with a Cartier panthre de small 22mm 18 karat gold watch if you're hunting for an outfit idea for when you want to look casually cool. Spruce up this getup with white canvas low top sneakers. 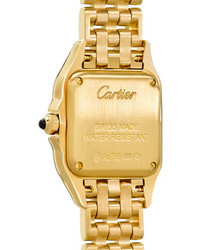 If you're all about feeling relaxed when it comes to dressing up, this combination of a light blue shift dress and a Cartier panthre de small 22mm 18 karat gold watch from NET-A-PORTER.COM is totally for you. To add oomph to your ensemble, finish off with black suede over the knee boots. If you're obsessed with relaxed dressing when it comes to your personal style, you'll love this stylish combo of a white kimono and a Cartier panthre de small 22mm 18 karat gold watch.